Έκδοση: Απρίλιος 2002 από "Grivas Publications"
Θέμα: "Αγγλική γλώσσα - Διδακτικά βιβλία για ξένους" "Αγγλική γλώσσα - Σπουδή και διδασκαλία"
Speaking, listening and writing is a six-book series. The first four books in the series are for classes A, B, C and D. They are topic based and have been designed specifically for young Greek learners of English. They offer students the opportunity to gradually familiarise themselves with the skills they will need to develop in order to prepare themselves for the Cambridge FCE examination. Each unit consists of two lessons on a related topic. Each lesson comprises speaking, listening and writing tasks that have been specifically designed for the age, interests and language ability of their particular level. Speaking: Students gain practice in pairwork, talking about themselves, comparing and contrasting pictures and taking part in wider part in wider discussions on related topics. 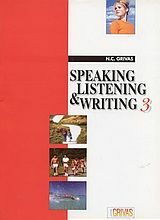 Listening: Students develop their listening skills though a wide variety of listening activities such as multiple choice, note-taking and gap-filling. Writing: Within each lesson there are micro writing tasks that give students the opportunity to develop their writing skills gradually and purposefully. From an early age, they learn to do simple transactional tasks, write messages, complete newspaper articles, and write letters.